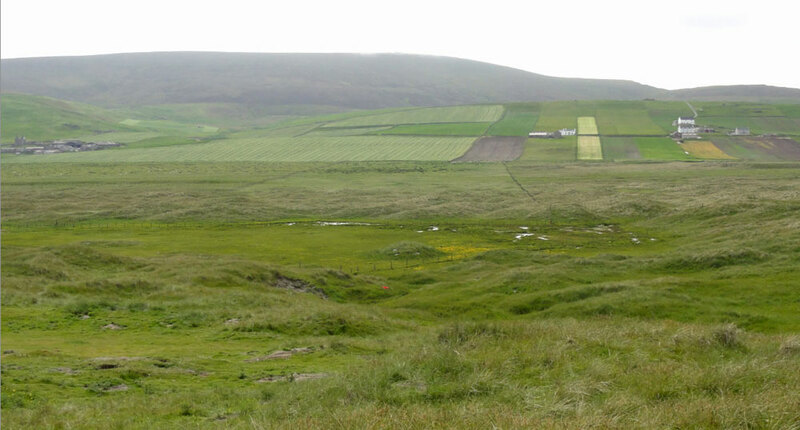 Researchers from several colleges in Maine, including Bates College, the University of Maine and the University of Southern Maine, are working together on a multidisciplinary and international 3-year NSF project focusing on the severe climate transformations of the Shetland Islands, the most northern of the Scottish Isles. Specifically, the project focuses on a settlement in Quendale Valley [Figure 1] that was entirely buried by forceful sandstorms and subsequently abandoned between 1690 and 1710AD. 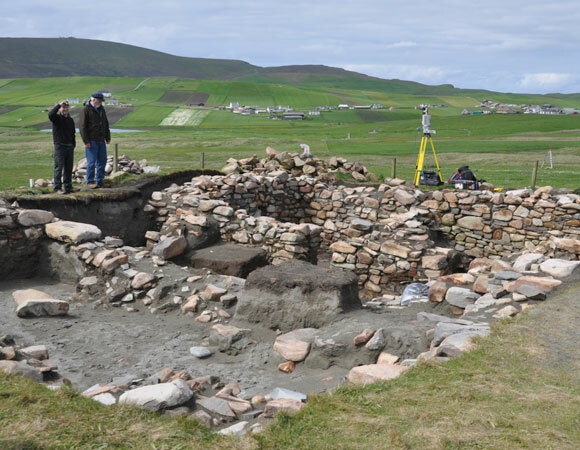 This time period was marked by great climatic change as well as social transition in Shetland, both of which are of great interest to the project as it strives to reconstruct the 17th century landscape prior to sand inundation and the human history of the area. 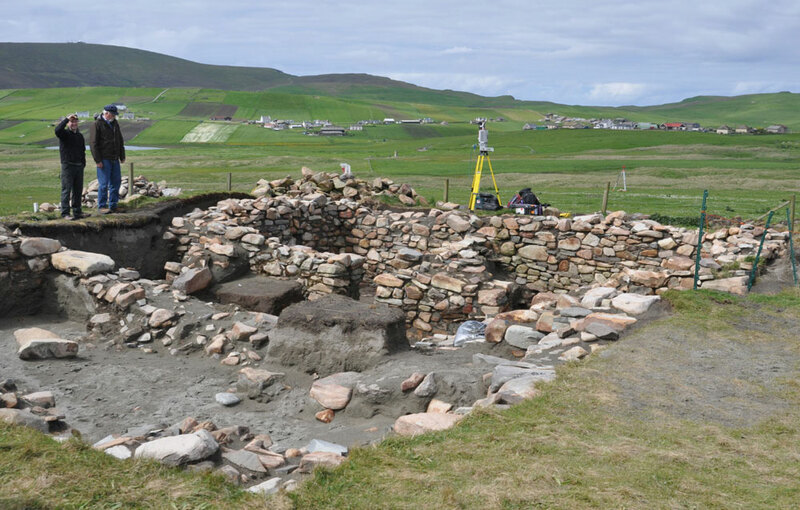 Archeologists, geologists and biologists are employing a variety of techniques to gather data. Specifically, they are employing Ground-Penetrating Radar (GPR) to locate other buried structures and the stratigraphy of the sand deposits, sediment and soil analysis to identify organic and inorganic material unearthed at the site and to determine the geological source of the sands, lake cores from the nearby lochs (lakes), archival research at various Scottish institutions to track written history about the area and its people, and archeology methods at the excavation site. Figure 1. The settlement in the midst of excavation. Layers of sand can be seen in the section of earth in the middle of the photo. At this site, approximately 2 meters of sand dramatically buried the site, forcing its inhabitants to abandon their home. Figure 2. Quendale Valley. 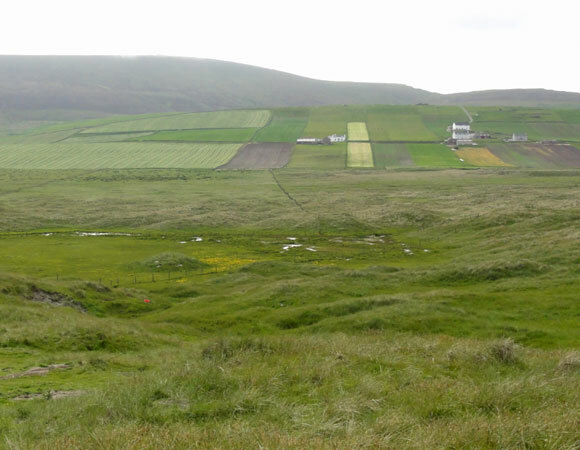 The grass-covered dunes in the foreground and middle portion of the photo may be hiding other abandoned settlements from the same time period. UNAVCO provided field Terrestrial LiDAR Scanning (TLS) support for two weeks to capture the main archeological excavation as well as the surrounding dune-filled landscape [Figure 2]. The data will serve multiple uses for researchers at the University of Southern Maine. The primary purpose of the scan is to create a broad 3D map of the area which will be used as the basis for a geodatabase incorporating historical maps, GPS surveys, ground penetrating radar data, archival records and photography to help characterize the chain of climatic and historic events in this valley at the onset of the climatic crisis. This 3D model will also be used to create wind models to recreate sand dune generation and soil erosion patterns. 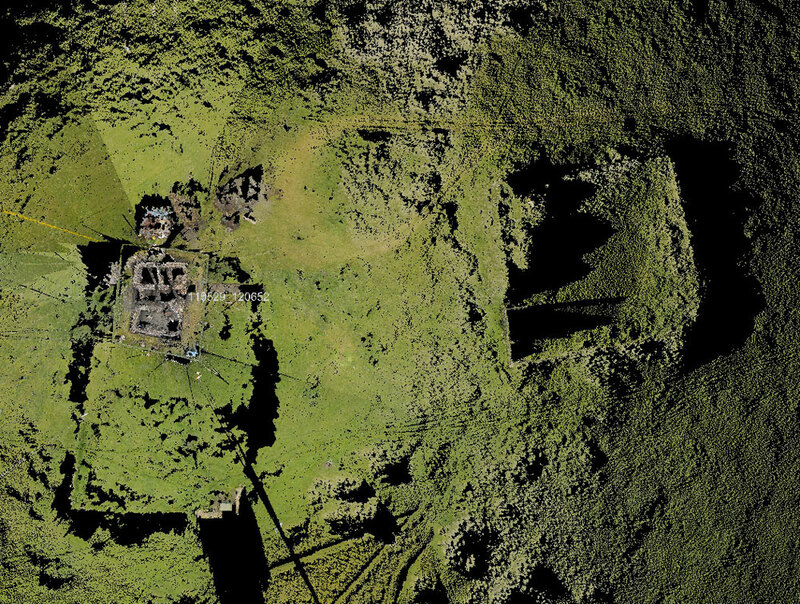 Finally, the data is helpful for identifying other buried settlements, whose rectilinear features are often more easily identified using 3D imaging than with the naked eye, as the software creates a variety of perspectives with which to observe the images [Figure 3]. 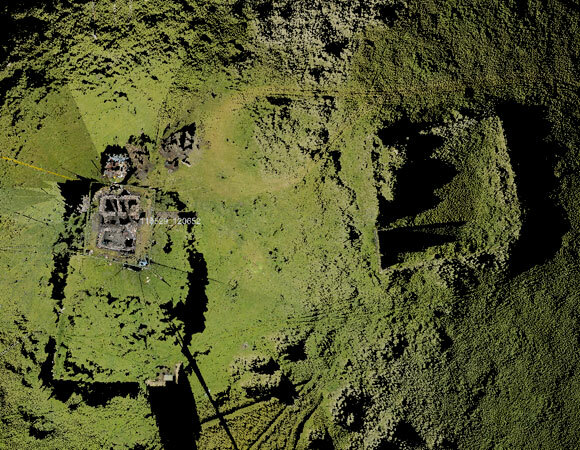 LiDAR data collection for the site was completed in 2012. In 2014, Dr. Matthew Bampton, of the University of Southern Maine, was awarded a Fulbright Scholarship for a six month period at the University of Edinburgh to develop a model of the process by which environmental and social changes came about the settlement in Quendale Valley. The TLS data is central to the 3D geographic model.